We got POWAH!! We got Internet!! From this point forward we should be able to make rapid progress in establishing a viable home and business environment in Floyd, VA. These drab enclosures mark a major transition in our lives. The pad-mounted transformer on the left supplies us with 400 amps of 120/240 volt power for home and workshop. The slim green box houses the telephone connection that brings us telephone and high-speed Internet service. Even though our house is out in the country, our utilities come in through underground cables. No longer are we refugees stranded in the awful gulf between homes. Thanks to the hospitality of Doug and Amy Thompson, we have been able to stay in communication with family and friends, but there is no substitute for having our own base of operations. When we arrived at the homesite yesterday, a contractor was already filling in the trench that brought the power and phone cables to the nearly completed workshop. An hour later, he had installed the meter and we were good to go as far as electrical power is concerned. I was pleased to see that the power cables were 3/4 inch in diameter, as the run from the transformer is about 200 feet. The telephone company still needs to do its peculiar magic before we can log onto the Internet, but that too should be handled in the next few days. Unlike some family and friends who are content to live "off the grid" as a solution to finding a satisfying lifestyle, I feel that we live in a connected world and a satisfying lifestyle has to involve involve open communication. There is incredible power available to those who are in a position to communicate with those who live and work elsewhere. Communication is the first step in harnessing the power of relationships and mutual efforts. 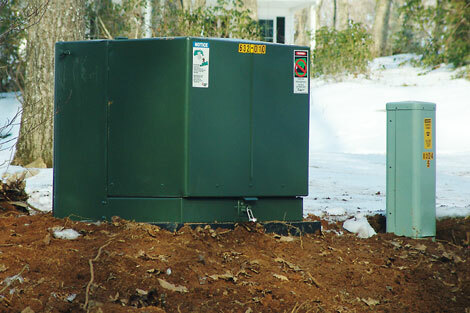 Since communication requires power, the appearance of these two green boxes on our property signals the beginning of a new cycle of communication and opportunity. We are still battling glare ice on our street and on our driveway. I had scattered dirt on the icy snow so I could walk without falling, but this did not handle the entire driveway. The delivery of our new refrigerator and stove was stymied when the delivery truck could not negotiate the final 200 feet to the house. The well-drilling contractor is unable to put in the trench which will bring a water line to the house. The heating company will not be able to deliver our new wood stove until there is a safe way to carry the 420 pound stove from thwe truck to the house. Hopefully, we will have a solution to this problem today. Our excavating contractor will spread gravel on the driveway until we have more stable access to house and workshop. This is our immediate hurdle to overcome, as we must have water, heat, and an operational kitchen. When we have these handled, we will tackle floor coverings, unpacking Smart vaults and furnishing the house. This series of posts has developed a life of its own and I would like to continue developing the theme through the establishment of a fully working house and workshop environment. On the other hand, there are business, aging, and post-corporate issues that I enjoy writing about and these get short shrift with the amount of attention I put on the new house cycle. I am concerned that so much writing about building a new home will be a distraction for those who are looking for more philosophical and analytical articles about life and work. My question for you is: Should the house articles be spun off into a related blog, which would have a link from this site, or should I leave them as part of this increasingly eclectic site? I know that readers have less and less time to read, so my instinct is to leave everything in one convenient place and let readers decide whether today’s offering is worth spending time on. This entry was posted in Moving to Floyd. Bookmark the permalink. I like it all on one blog. I can scroll, read, look at pictures, and even check the categories for the subject threads that intrest me most. Just my 2 cents. I have enjoyed the house-building series as we will be facing the same in a few years or sooner if another Katrina hits New Orleans. The things we take for granted we learn to appreciate when we lose them. We have been moving in stages over the last few weeks into an undamaged house in New Orleans so my hurting body has great sympathy for you and Gretchen. Please keep posting the progress and take lots of notes because one day we will be asking you for them when we move there and are neighbors. I know I don’t represent the majority, being an independently successful internet development entrepreneur whose major interests beyond family include a new horse farm and various farm and home improvement projects 🙂 But my vote is for writing related to establishing a home and home business related endeavours. Perhaps you can intertwine business and home interests in an interesting way. So many people I know in this area have home offices. In Blacksburg, neighbors to either side of me also were based out of a home office. I am a frequent watcher of home shopping and improvement related shows on HGTV and find that nearly every family requires a home office. So there is certainly interest in that vein of thought and self improvement. I think you should leave them in the same blog. They do and don’t seem to fit with what you’ve described on your “What kind of blog is this?” page. But I really enjoy reading about your adventure. Heck, leave it all together as far as I’m concerned. It’s your publication, though, so if it’s a distraction for you then go ahead and change it. My feeling is that it is all part of one package. You are having this particular post-corporate adventure because you have made the other decisions that you have made about your life and your career. You wouldn’t be moving to Floyd if you were still working a corporate job. I’m interested in reading it all, so you won’t lose me as a reader in either case. Would definitely spin off. I’ve enjoyed ready about your housing adventures, but that is not what draws me to your writings. As a relatively new consultant, I am negotiating my way through the post-corporate life. I’m finding the life of a soloist to be re-creative and value the views and experiences of others who find or who have chosen this more solitary place as the place to be. I’d say just mix them into the whole, and let people filter by category if they only want to see house entries, or whatever their interest may be. I enjoy your writing on all this, and can relate to the ice – I lived near there for 6 years, and during one storm we had between 4 and 6 inches of pure ice on the ground. That took about a week to melt enough to be remotely normal. Delurking to say leave it as one–I enjoy all of your writings and it’s much easier to keep up with just one blog. Plus I think it’s interesting to see different sides of people! Thanks to all who took the time to comment. I will leave the blog format alone, but I will intersperse other topics more frequently to keep the mix interesting to those who are looking for professional topics as well as post-corporate life topics.